There are several looping statements available in java. One of them is for loop in java. For loop in java is used to execute some statements repeatedly until condition returns false. There are three parts to for loop. 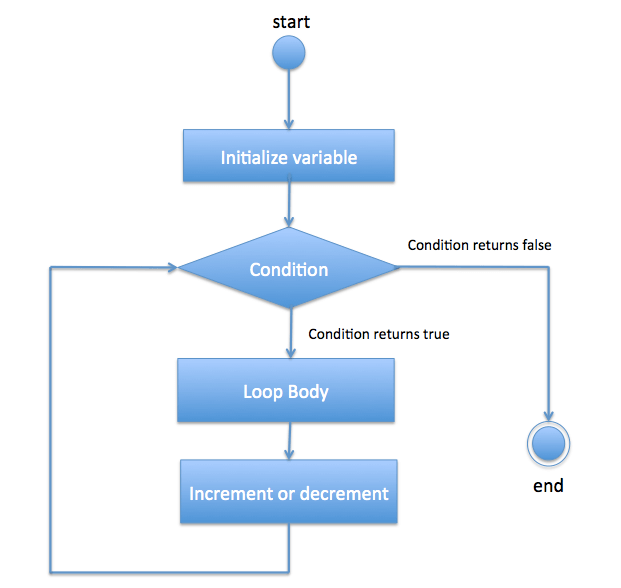 Initialization: Initialization statement executes at beginning of loop only once. condition:Condition gets evaluated in each iteration. For loop executes block of statements repeatedly unless condtion returns false. Increment/Decrement: These statements get executed in each iteration. If you are still confused with above concept, let’s understand it with the help of flow diagram. Let’s try to print only even numbers now. If you are given array of integer, you need to find an element in that array. I would recommend you to try it yourself and then look at below code. You need to be careful with condition you provide in for loop otherwise you may end up creating infinite for loop. Now in above code, instead of i–, you have put i++. In this code, loop will go into infinite loop. You can use multiple variables in for loop too.